In January 2017, Croft Associates were approached by an existing client with a very challenging project whereby they desired to accelerate the shipment of wasteforms between two UK licensed sites. 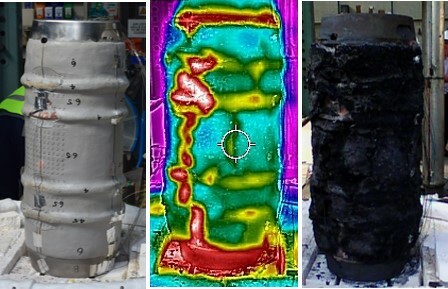 A particularly challenging aspect of the project was the need for thermal management of the wasteform to prevent adverse degradation of package contents during transport and subsequent on-site storage. Croft Associates, working with the client and associated stakeholders, initially developed a solution based upon an evolution of the very successful Croft 2816 J B(M)F package, already in service with the client for similar wasteforms. This new solution, the 4085A, was optimised for heat dissipation in order to mitigate against the wasteform degradation mechanisms. Following further development, including regular briefings held with the regulator to keep them informed of the design progress, it became apparent that the thermal accident case for the developed solution would be challenging, and therefore a means of meeting full thermal accident conditions of transport was highly desirable. Croft therefore proposed the utilisation of intumescent coating, in particular the International Paints Chartek 7 system, as a means of providing the desired fire protection under accident conditions of transport without compromising the heat dissipation features of the package. This paper provides an overview of the initial package development, with particular emphasis upon the selection of an appropriate intumescent coating. The paper then describes the substantiation of the package performance, specifically highlighting the intumescent coating performance, by providing an overview of the test, analysis and substantiation works undertaken to support the licensing of this 4085A package.